Social Security is now more critical than ever to whether retirees can make it financially, because traditional pensions are becoming rare. 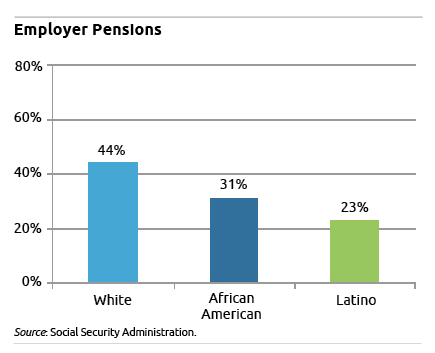 African-Americans and Latinos who are 65 or older were less likely to work for an employer that offered its employees a traditional pension, according to SSA data. 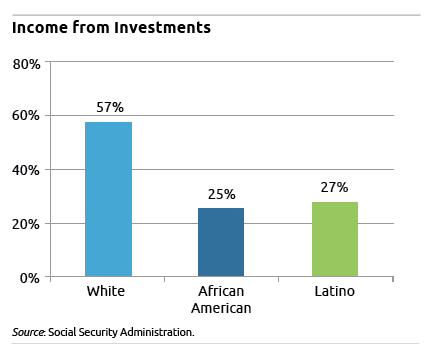 African-Americans and Latinos are behind the retirement 8 ball in another way that’s related to their income and their greater difficulty generating wealth: only about one in four African-Americans and Latinos over 65 receives income from investments, while more than half of whites do. 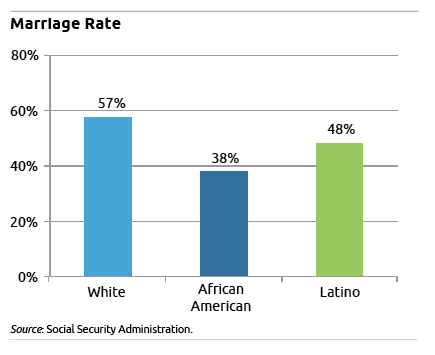 Ruffing said that married couples have historically done better economically, which benefits them in retirement, but marriage rates among African-Americans and Latinos are also lower. It helps to be married, because two-income couples may have two pensions to draw on while they’re both retired. “Economies of scale” also benefit them, because they can split up their housing and other large expenses, she said. And when one spouse dies, the spousal benefit from Social Security may be higher than the living partner’s pension from their own employment. America’s pension system is often described as being precariously perched on the proverbial three-legged stool: Social Security, employer pensions, and investment income. 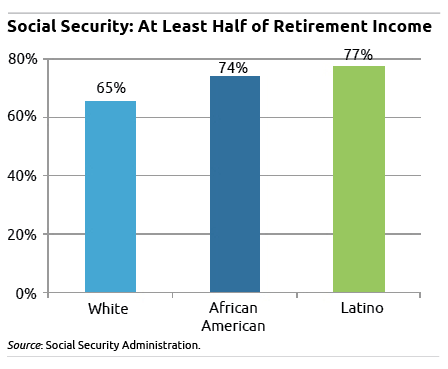 The Social Security leg is by far the strongest for the nation’s African-Americans and Latinos. I would like to say that every one does have a right to Social Security. This article was very good. One important thing that the author neglected to clarify in the graphs: these are data for Social Security beneficiaries age 65 or older, from the agency’s biannual “Income of the Population 55 and Older” report. One can imagine a system of 401(k)s that would produce good retirement income. Investing 15% or more of every pay-check, into low-cost broadly-diversified index funds, not withdrawing or borrowing (other than periodically for retirement) and not trying to time the market. Unfortunately that is not the system we have, making Social Security all the more important. Thanks for sharing. love that old advertisement for Social Security. We are in the midst of various discussions on Social security and hopefully we end up going in the right direction in the future. Initially, the intent of Congress was to have a contributory plan where each worker would save for his own retirement. It was only later that Congress changed the benefits formula to “redistribute” income from the wealthier to the less wealthy. See the History section on the SSA website. Social Security is one significant aspect in a country because it obviously secures the people in the country. So it is very important to make one country’s Social Security become more active and well-organized. I totally agree that everybody has the right to have Social Security. Thank for this article! I really had a great time reading this article. I agree with the first comment. White or not, everyone should be entitled to Social Security. Good article.